We asked second year student, Habeebah Kauser, why she loves JCC. 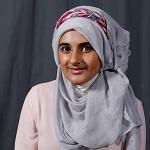 Habeebah is a member of the Student Council and is currently studying A-level Sociology, Media Studies and Philosophy, Religion and Ethics. Joseph Chamberlain offers a range of enrichment programmes (known as JCC Extra) which enable students to broaden their knowledge. This was set up by the college to prepare individuals for university, alongside improving proficiencies that will be useful for the world of work. Similarly, these programmes teach life lessons to students that will not only be beneficial for higher education, but for life as a whole. These programmes will strengthen your chances of getting into university, by making you stand out amongst the other thousands of applicants. This programme not only enables you to gain skills, strengthens your personal statement and prepares you for the world of work, but it also gives first year students the opportunity to gain friends with similar interests and mindsets. The majority of these programmes occur after college; but nothing is more expensive than a missed opportunity, and by not taking the opportunities offered under JCC Extra, it will be pricey in the long run. Click here to find out more about JCC Extra.